The concept of sustainability has penetrated our consciousness for long enough. Now, manufacturers of consumer goods are stepping up their game and creating superior eco products, teaming up earth friendliness with class and style. While we have valued products that decompose to reduce waste, manufacturers have picked up on more durable options. Take the car brand DeZir by Renault, for example. This two-seater, electrical powered sports coupe is a far cry from the original hybrid car models. This one could be fit for Batman. Green never looked so hot red, with all-electric super cars and plug-in hybrids on show at the Detroit Auto Show. It’s never long before Western trends hitch up ancient furnishing methods. Forget the disposability of IKEA. We’re introducing Ikat – a universal textile weaving style that values detail and production time. Instead of creating patterns and dying on top, the intricacy of the dying process lies in bundles of coloured thread being pre-dyed before being woven into the distinguishable pattern. While no one culture can claim the origin of the method, the ethnic style fits into Central and South American, Cambodian, Thai and Japanese cultures. Because of this flourishing design trend, we’ll now be seeing it in modern homes alongside minimalist whites and polished timber floors. 25-05-2011 Baby, Won't you Drive my Car? We’ve swapped books, exchanged clothing and shared gardens. The term ‘collaborative consumption’ coined in 2007 is now moving mainstream into the lives of both eco-aware and budget savvy car commuters. Organisation ZipCar and run-of-the-mill car rental service, Hertz have stimulated the eco trend by initiating car sharing services in urban areas. Their fractional ownership model allows members to pay an annual fee allowing access to a car for short trips, when they please. With the help of social networking and the web, Peer-to-Peer car rental companies connect car owners with those in need of a vehicle. UK based WhipCar and Australian Drive My Car arrange fully insured short-term rentals within communities and between neighbours. After all, sharing is caring. We’re not minding our business when it comes to the who’s who of dental jewellery. It may have started with hip-hop celebs like Lil’ Wayne and Kanye West donning shiny metal on their pearly whites, but now the lifestyle trend is moving mainstream. We can thank Johnny Depp for that. Once Pirates of the Caribbean: Dead Man’s Chest was finished filming, Depp announced about his gold pirate fillings, “They will be staying on, but only until we're done filming number three.” Pink and Sugababes, Mutya Buena have set the standards for women’s teeth adornment with Swarovski crystals or even real gems giving a subtle sparkle to the smile. Also in the US, tattooing the teeth is a trend on the rise. Indie music blossomed as a genre in the 1980’s to help publish the sounds of small, uncontracted bands. Today, Indie music is a lifestyle trend that is as fitting as ever. We just need to look at self-publishing web portals like YouTube and Facebook to understand the word ‘independent’. With the disappearance of the CD and the growing possibilities to record your own music on a low budget, traditional music labels are becoming redundant by the second. While MySpace is still used by music amateurs as a platform to expose their work, we’ve been mesmerised by another stylish music platform: thesixtyone.com. Here, artists can upload their music for free while thesixtyone.com community can easily donate money directly to the artist, without music labels taking a cut. That’s D.I.Y. to the core. From black boom boxes in the 80’s to white plastic Mac laptops in the 90’s, high tech matt silver was all the rage for technological devices in anticipation for the robotic future ahead. Now, mainstream pop culture is opening its arms to organic materials for gadgets. There has been a multitude of contemporary design companies worldwide producing sound-enhancing wooden headphones. Hipsters have been spotted sporting the organic earpieces donned in equally organic earthy cotton threads. Vers Audio, who also make a bamboo variety, plant 100 trees for every tree they cut down for production. With the modern demand for both technology and sustainability, predictions point to the fusion of the two to satisfy the new generation’s insatiable appetite. Slacklining, a balancing sport much like walking a tightrope, has had exponential growth of interest since its official introduction. The time was the 1960’s and 70’s and the place, Yosemite National Park. How is it different from walking a tightrope? The line that you walk in slacklining is dynamic. It stretches and bounces like a trampoline, challenging the core muscles and mental focus of the player. Trees make the most likely anchor for setting up a slackline and they can also be found spun over canyons worldwide. Dare try slacklining? Purchase a kit from Slackline Australia’s website and start your very own balancing act in the backyard. “When I’m doing a drawing, I’m personifying the place that is empty” says sand inscriber, Jim Denevan. It seems he is not the only artist making his mark on the earth. Since the 60’s and 70’s, Land Art formed as a movement to protest against the ruthless commercialization of art in America. Within a couple of hours, sand artist, Jamie Wardley will create portraits sometimes 800 metres in diameter in the sand which are eventually corroded by the sweeping of the shoreline. While Andreas Amador and New Zealander, Peter Donnelly opt for graphical and symmetrical murals, all artists know that being precious about their masterpieces would be detrimental to their core concepts. So much for sustainability. Furniture designers are retreating back into the core of design history when graphic designers would create typography for magazines by hand. Take a seat on Helvetica, for example? Palette Industries’ designers used a polished black ‘h’ to form the structure of a chair while the rounded hook of an ‘f’ became a lamp. Other great examples for typography in furniture design are LifeSpaceJourney’s range of unique chairs, Tabisso's lounge chairs and the Dhama Lounge. 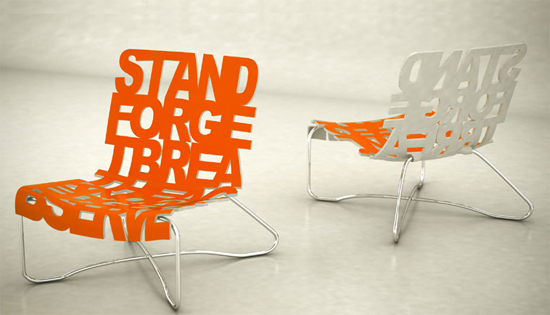 Its message ‘Stand, forget, breathe, acknowledge and observe’ keeps the owner’s backside off the seat and is an ode to design as art. ‘Splish-Splash-Splish-Splash’ is the breath of the new generation Clean Energy Water Clock. While mechanical gadgets possess our lives, the creators of the clock have gone back to basics, utilizing one of the earth’s greatest natural gifts to power the device: water. While electrolysis is to thank for its functionality, its innovation lifts the standards for future eco trends. The most unique alternative to pouring water within the compartments is growing plants instead! That’s right. Add soil, nurture a cutting or grow a plant amid the digits. Instead of tending to another screen or button, the clock encourages its owner to take the time to connect with nature. Creator of Facebook, Mark Zuckerberg is notoriously, a man of ingenuity. Now, his contingent of over 500 million active members is growing to be discerning and they're getting smart. In keeping with the sceptical theme of an American 60 Minutes episode, where reporter Lesley Stahl brutally questioned Zuckerberg on Facebook's privacy policies, new sites are being launched to "reclaim your privacy". This new lifestyle trend sees websites like Reclaim Privacy and Untangle's SaveFace recruiting users to install their products to reset your privacy settings on your Facebook account. While Openbook provides a unique and open tool to search Facebook updates, the demand for defamation lawyers who specialise in online media is developing rapidly. Furniture designer, Clayton Tugunon has called on his childhood experiences to design a Pacific island-inspired collection of seating for Snug Furniture. Designing “from the gut,” Tugunon has utilised coconut twigs, rattan and wood to manufacture each low-slung seat. The pieces are labelled ‘Lounge Chairs’ or ‘Love Seats,’ perfectly describing their flowing, organic forms and lack of legs. These qualities combined with an unusual, highly polished finish evokes being waited on in idyllic scenery. Not a bad eco design trend to perpetuate more good times. America’s MOMA and the Guggenheim Museum have both housed the Windcheetah, a recumbent, carbon fibre tricycle appreciated for both its classic design and racing capabilities. The modernised version produced by AVD is a reconstruction of Mike Burrow’s 1980’s design. The new, predominantly carbon fibre framework, as well as being very durable, is incredibly lightweight and has low thermal expansion – making it well protected from its outdoor environment. It even appears Apple is taking suit with rumours circulating that the company has hired a carbon fibre expert for producing future iPhone and iPad models in the versatile material. The tricycle has a unique chassis for either touring, leisure or sport riders, placing the AVD company at the forefront of design trends in the cycling world. Pricing for the Windcheetah HyperSport starts at around $5,000 plus shipping. 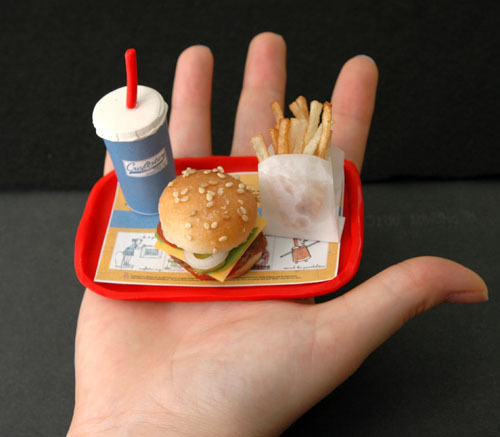 Who would have thought we’d ever revert from “super size” to “mini size”? Just when we thought Western nations’ waists were expanding, we’re sprung with a new lifestyle trend to turn the scales. It appears that the food industry is distancing itself from overly generous portions and presenting us with bite size treats instead. Trendy Australian consumers have attached their teeth to tapas parlours which serve up multicultural cuisines, not just traditional Spanish dishes. These bars bring together a melting pot of Asian, Spanish, Mexican, American and Italian flavours all on one menu and sometimes on a single sharing plate. Some American food chains also offer bite size slider burgers and cupcakes are fading in size too. Is there a downside? While we elegantly nibble on our bird food, eateries tap into this trend, gaining lucrative sales from each teeny tiny morsel.